Hold your nose and offer up praise for the much-maligned but most worthy vulture. Bet you’re picturing an old Western movie, where a thirst-crazed cowboy crawls across a blazing desert while vultures circle slowly overhead, waiting patiently for him to heave his last breath before swooping down for the feast. Neither sweet like songbirds nor majestic like eagles, perhaps vultures seem too ugly to love. Many of us associate them with death, disease and decay, viewing them as sinister, grotesque carrion-eating scavengers, the bottom feeders of the avian world, too lazy to hunt for fresh meat. My friend Carol, the “vulture lady,” vehemently disavows these ugly stereotypes. While many neighbors in her posh Northwest Austin neighborhood hang birdfeeders around their homes to attract colorful buntings and cardinals, Carol used to set defrosted chickens out on her hillside deck to feed black vultures and turkey vultures — the only two vulture species found in Texas. Carol’s vulture clan drifted away a few years ago, although a few visit on occasion. A vulture's bald head and neck help the bird stay clean when diving into a carcass. Turkey vultures and black vultures, the most numerous of the seven species of New World vultures, abound in Texas. We see them everywhere: circling in thermals, roosting in trees and towers, and gathering at roadkills. Like all of the world’s 23 species of vultures, turkey and black vultures are obligate scavengers, feeding mostly on carrion, the flesh of dead animals. While New World vultures of the Americas and Old World vultures of Europe, Asia and Africa share similar scavenging behaviors and appearances (bald heads, hooked beaks and large wings), they are biologically unrelated. DNA testing indicates that New World vultures are closely related to storks, while Old World vultures are akin to raptors such as eagles and hawks. The word “vulture” comes from the Latin word vuellere, meaning to pluck and tear, which is how they feed with their long, hooked beaks. While vultures prefer fresh meat, they will eat carrion in various stages of decomposition (except for extreme putrefaction). Endowed with powerful digestive systems and corrosive stomach acids that destroy microorganisms and toxins, vultures are able to consume carrion without contracting diseases. Consummate recyclers — they’re basically nature’s hazmat team — vultures play a vital role in the food chain by ridding the landscape of decaying carcasses that could harbor pathogens. 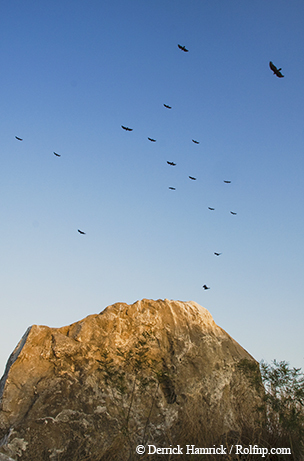 Vultures fly in groups called kettles, soaring high on thermals as they scan for their next meal. Vultures shine at soaring as well as sanitation. On the ground, they seem graceless, hopping about with a clumsy gait. But when vultures take wing, they’re in their element, masters of the air. Catching rising thermals and gliding on air currents, vultures soar as gracefully as hawks and eagles. They can stay aloft for hours and fly scores of miles, expending very little energy as they scan the landscape for their next meal. Turkey vultures, the most widely distributed New World vultures, fly in great migrations and range from southern Canada to the tip of South America. Their scientific name — Cathartes aura — means “cleansing breeze” or “purifying wind,” from the Greek words cathartes (catharsis or cleansing purification) and aura (breeze). Cloaked in black-brown plumage, turkey vultures have ruddy, featherless, wrinkled heads, similar to wild turkeys — hence their common name. Another frequently used name, “turkey buzzard,” is a misnomer. In the Old World, buzzards are raptors in the genus Buteo; in the U.S., we call them hawks. When Europeans settled in North America, they mistakenly thought turkey vultures were large hawks, calling them buzzards. With light bodies (up to 5 pounds), long tails and wingspans of up to 6 feet, turkey vultures are aerodynamically built for flight. Aloft, they hold their wings in a shallow V or dihedral, slightly above the body plane. When flying close to the ground, turkey vultures tip their wings in a seemingly unsteady jinking motion, helping them maintain stability at lower altitudes. Black vultures also excel at soaring despite having very short tails and heavier, stockier bodies and shorter wingspans (up to 5 feet) than their turkey cousins. Their ungainly takeoffs begin with a flurry of laborious, flapping wingbeats. Once airborne, they tend to circle higher in the thermals than lower-flying turkey vultures, and they hold their wings nearly flat like eagles and hawks. While turkey vultures are found across much of Texas year-round, many individuals are somewhat migratory. Black vultures reside year-round in the eastern, central and coastal areas of Texas (but are less common in West Texas). The scientific name for black vultures, Coragyps atratus, aptly means “vulture dressed in black,” as if in mourning. With their sooty-black plumage and bare, gray-black heads, black vultures call to mind somber avian undertakers. 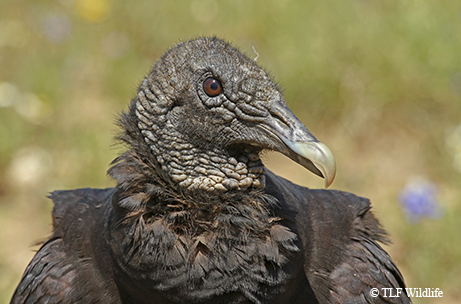 The most striking difference between turkey and black vultures is sensorial, affecting how they find their carrion meals. “Turkey vultures have an exquisite sense of smell and can detect a few molecules of rotting meat at great distances,” says Ian Tizard, a professor in the College of Veterinary Medicine at Texas A&M University. One of three New World species in the Cathartes genus with a highly developed olfactory ability, turkey vultures can detect the odor of rotting flesh in concentrations as minute as a few parts per billion. They flock to the pungent odor of ethyl mercaptan, a gas produced when flesh decomposes. 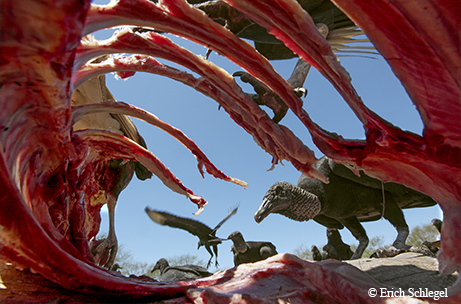 Black vultures have a poor sense of smell, relying instead on their sharp vision to spot dead or dying animals. When higher-flying black vultures spot turkey vultures descending to feed, they often swoop down and drive away the less assertive, more solitary turkey vultures. Texas vultures come in two varieties: black vultures (above) and turkey vultures (below). Although turkey vultures and black vultures have few natural predators, they share a potent defense: their stomach contents. Lacking a syrinx (vocal organ), turkey and black vultures hiss and grunt when disturbed. Like other New World vultures, as well as their stork relatives, turkey and black vultures defecate on their legs and feet. In addition to sanitizing their legs by killing off bacteria with highly acidic excrement, this behavior — a form of thermoregulation called urohydrosis — helps vultures stay cool through evaporation during hot weather. Instead of making nests, turkey and black vultures lay their eggs directly on the ground and inside brush piles, hollow logs, shallow caves and abandoned buildings. These family-oriented birds maintain long-term monogamous pair bonds. 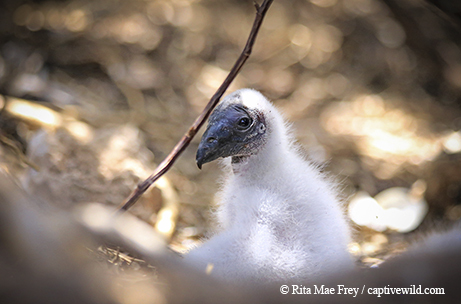 Abiding parents, mother vultures feed their young up to eight months after fledging. Both species are social and roost overnight in trees and on power lines and radio towers. When large roosts in residential areas pose a nuisance, some communities practice “vulture hazing” — discharging loud pyrotechnics to drive them away. According to Tizard, rural communities once tolerated black and turkey vultures as largely beneficial scavengers. Nowadays, many ranchers dislike black vultures, complaining that they prey on newborn or weak calves and sheep. Aggressive by nature, black vultures sometimes turn predatory and kill small mammals and other birds. Although black vultures, as well as turkey vultures, are protected under the U.S. Migratory Bird Treaty Act, ranchers can obtain permits to trap, shoot and poison vultures believed to be killing livestock. Until the 1970s, the egg-thinning effects of DDT contaminated turkey and black vultures, as it did with many raptors. 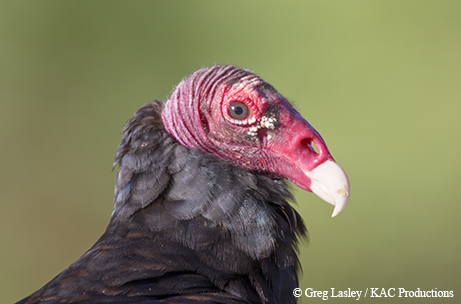 Although still sensitive to habitat loss and lead shot in carcasses, black and turkey vulture populations in the U.S. are stable, even increasing. More adaptable than turkey vultures, black vultures can tolerate human presence and pressures and have expanded their range over the past several decades, steadily advancing north and east from Gulf states into New England and as far north as Ontario. Avian experts speculate that black vultures are following the expansion of highways and the resulting trail of roadkill. The Humane Society estimates that vehicles kill a million animals a week in the U.S.
Downy chicks emerge from eggs laid in makeshift nests in logs, caves or brush piles. While turkey and black vultures are thriving in the Americas, nearly a fourth of the world’s vulture species are in deep trouble, some facing extinction. An estimated 97 percent of India’s vultures have died off in recent decades, poisoned by a veterinary painkiller (diclofenac) that tainted cattle carcasses. Poisoning and poaching have decimated vulture populations in many African nations. In the Americas, the California condor teeters on the edge of extinction, and the Andean condor also faces dire threats. The prominent environmentalist David Brower wisely observed, “When vultures watching your civilization begin dropping dead, it is time to pause and wonder.” To raise public awareness of the plight of vultures in many parts of the world, avian enthusiasts now celebrate International Vulture Awareness Day, held the first Saturday in September each year since 2009. Turkey vultures enjoy a growing fan base through the Turkey Vulture Society (turkeyvulturesociety.wordpress.com), dedicated to promoting the environmental benefits of these red-headed vultures. Ponder this parting thought the next time you see vultures soaring in the summer sky or huddled over roadkill along a highway.